The original image is in the public domain due to its age. To write or to tweet: ay, there’s the rub! For to write is to live. And to tweet is to promote. But what is a writer without a quill? But nay, must a writer have readers? Is not a writer merely someone willing to suffer the slings and arrows of critics! Someone willing to enter the fray one more time for his craft! Can one fault the writer for following his muse to where he knows not? But fear of the enemies lies deep in the heart of writers. They stumble at the feet of Inertia. They sway to the lulling of imaginary Writer’s Block. They succumb to the lure of social media. Oh to tweet. To sleep. To sleep. Perchance to dream of readers and followers. With nary a thought of the ignoble death that comes from a silent quill. The death of a writer. Ay, but the draw of the tweet. The promise of a following. Still, naught can be attained by the writer who has dropped his quill. Who has lost his way amid the tweets of the day. So write on. Write on dear writer. Write on. 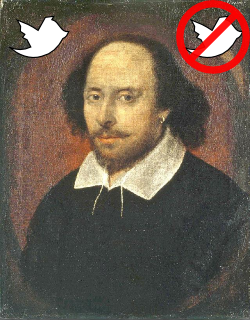 Do not be enticed to supplant the quill for the tweet. Do not tweet. Do not sleep. Do not dream. Pick up the quill and write. Tweet when the deed is finally done.